Charlie introduces us to a hardy variety of honeysuckle that produces delicious berries. 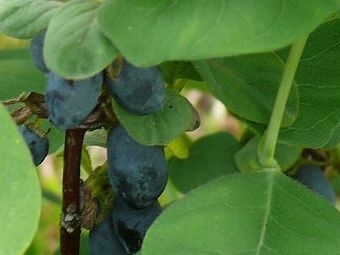 Under the names ‘Blue Forest’, ‘Blue Sky’ ‘Blue Berry’,’Blue Belle’, and ‘Blue Velvet’ the Siberian honeyberry is available in greenhouses and nurseries. Tune in Friday evening and Saturday morning for more details on this underdog of ornamentals and tips for planting success. normally thought of as ornamentals that also produce great fruits for eating. ornamental edible that I’m going to try is the honeyberry. strawberries. Unlike some honeysuckles, this one is not invasive. least two different varieties to get the most fruit. to keep the roots cool and moist. cakes, muffins, jams, and jellies. now, I’ll be seeing you in the garden! Charlie shares the method and science of planting shrubs and trees, starting with the bare roots.